Karaage is Japanese style fried chicken. 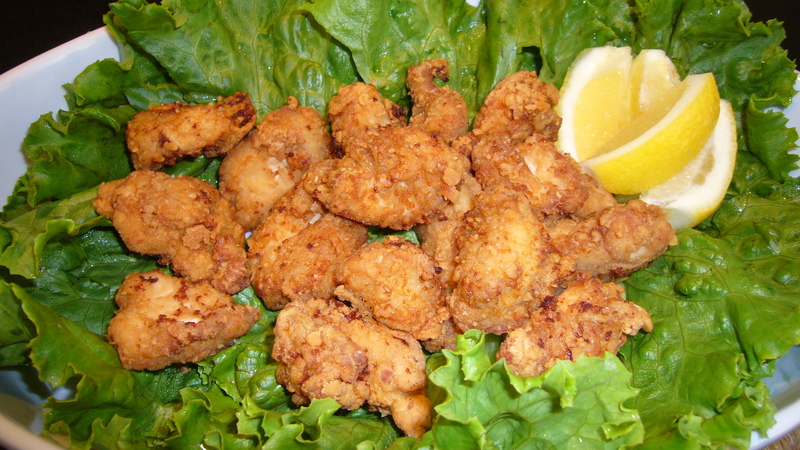 In Japan Karaage is one of the best party recipes and Kids’ favorites. It is very easy and simple to make it, so give it a try! (1) Cut up the chicken into bite-size pieces. (2) Put the chicken, sake, soy sauce, garlic and ginger juice in the Ziploc bag, and zip the bag. Then mix well and let marinate for 20 ~ 30 minutes. (3) Heat the oil to 165 ~ 170℃ ( a little lower than the medium heat ). (4) Drain off the marinade and put cornstarch and flour in the bag. Toss it well and make sure the chicken pieces are completely coated. (5) Fry the chicken pieces until deep golden brown. (1) Leave the chicken pieces in the heated oil for the first one minutes. (2) Then flip them over in the oil occasionally for about 5 ~ 6 minutes. (3) Before taking them out from the oil, turn the heat highest to make Karaage more crispy.